One of the basic principles of healthy eating is to make the calories you consume count towards your nutrient requirements for the day. So, what makes calories qualify as "empty?" The best criteria for judging the value of the calories you are consuming is to ask yourself, does the food supply a variety of vitamins, minerals, high quality protein, good fats and good carbohydrates, including fiber. As a rule, empty calories are deficient in nutrients, particularly vitamins, minerals and fiber. Another way of saying this is that when a food’s caloric value far outweighs its nutrient value, it is not the best choice for a healthy diet. If you are interested in learning more about the five major nutrients, click on the link for each nutrient provided here. Another factor to consider when choosing a healthy diet, is that highly processed meats, snack foods and desserts, the lack of nutrition is made even worse by the high sugar, salt and chemical additive content of these "foods." Here is a list of empty calories, foods that you should consider limiting or eliminating from your diet. Soda and other soft drinks, Potato chips, Most Sour Cream Dips, Candy, Cookies and bars, Cake including Snack Cakes, Pie, Doughnuts, Most packaged muffins, French fries. Since most of us don't grow our own food these days, grocery shopping is one of those activities that is a necessary part of our lives. I don't know many people who enjoy this chore, but there are some ways to make it easier and to insure that you buy the best foods for yourself and your family. -Eat before you go shopping, so that you aren't tempted to buy sugary or salty junk foods. An empty stomach is directly correlated to weak will power. The store has all kinds of strategies to encourage you to buy more. Everything from the background music, to store layout, attractive displays, and signs telling you about "specials" is designed to get you to stray from your planned purchases. Don't let hunger make you easier to manipulate! -Make a list of the foods you need based on the meals you have planned. Keep a pad of paper and pencil in the kitchen to jot down items that you use up or that you think of as you are cooking or planning. -Don't buy coupon items unless they are healthy products you would normally choose. In spite of what all the frugality experts say, it isnft saving money to buy a product that you would not normally use, especially if it is overly processed or junk food that should never find its way into your cart,in any case. My experience is that most whole, unadulterated foods rarely show up as coupon items, unless they are local store promotions. 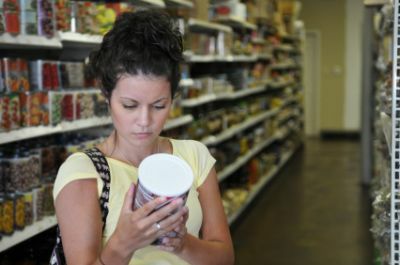 -Read food labels on packages and choose the products made from real food. The rule is that if you can't pronounce the ingredients, leave it on the shelf. Also look for excessive sugar (by all its names) and high sodium content and skip those foods that have either. -Stick to the perimeter of the store. When you shop at the supermarket, do most of your shopping on the outside aisles. This is where you will find much of the whole, unprocessed foods. The inner aisles are where most processed and junk foods reside. If you mostly avoid those aisles , you won't be tempted by the bright packages. What you put in your mouth is up to you. By choosing healthy, nutrient-dense foods more often than not, you are taking a major step toward feeling well and living a long, happy and productive life. Click here to go from Empty Calories to Best Diet Plan.